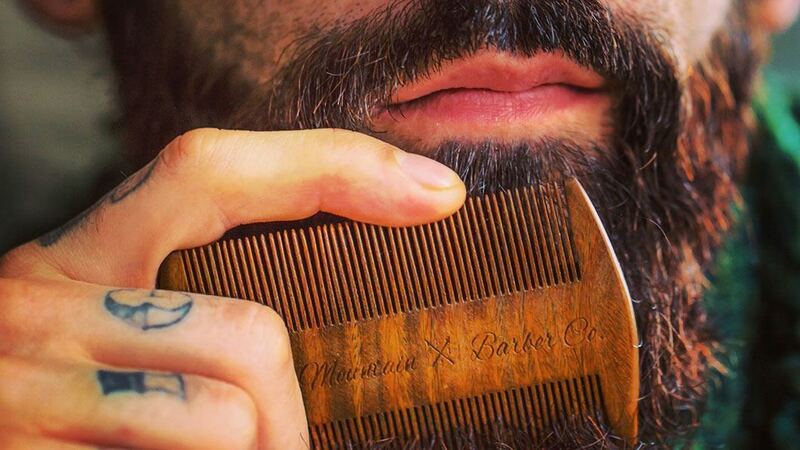 Using the best beard comb is one of the number one ways to get your beard looking its best. A comb designed specifically for use in beards offers quite a few advantages over normal combs. A key feature is that this type of comb distributes beard oil or other products evenly and reduces static commonly caused by regular combs. 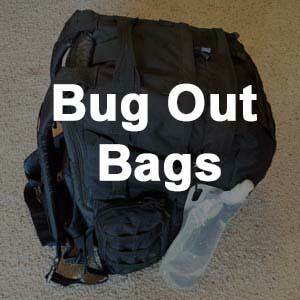 They are also designed with teeth and handles that are perfect for working through tangles with minimal effort. Luckily, there are several combs that give you both quality and affordability. 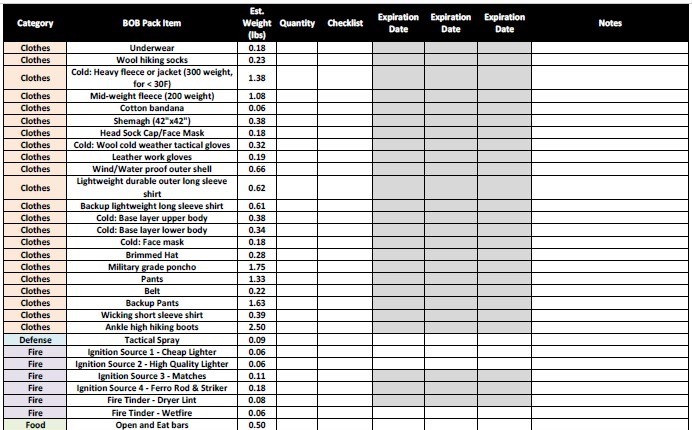 In﻿ this article, I researched a large number of options out there and came up with the top 10. Once you use a great comb on your beard, it will change your beard grooming for the rest of your life. Don't forget to take your other grooming serious as well. The Huntsman Dual comes with a faux leather pouch that keeps your comb from drying out and allows oils to soak in and treat your comb as well as your beard and face. This is a dual action comb with both coarse and fine tooth sides for more versatility for beard type. The finished wood teeth also dramatically reduce static so that you can keep an even, straight lay. We also like the length of the comb which helps cover more beard area at once and reduces the amount of time needed to groom your beard. This one is by far the best wooden beard comb​ you can get for the money. 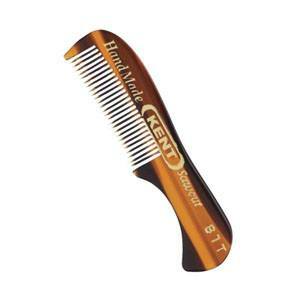 If you aren't a fan of wood for some reason, the Kent 81T is a quality plastic comb made in the UK. This is a very compact comb and is only 3 inches end to end. For large beards, it might be too small to be effective, but it is great for styling and working on your mustache. The comb is portable as it takes up little room. 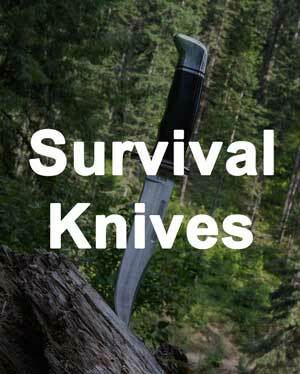 It has a thick handle that will allow you some leverage when working with a truly unkempt beard. 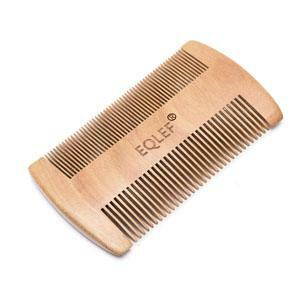 The EQLEF Green is a crafted, 100% green sandalwood comb that is polished to a wonderfully smooth finish. 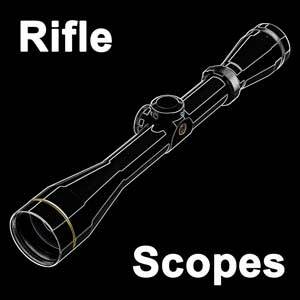 It has dual action teeth with both standard and fine tooth sides that are evenly spaced. This comb reduces tangles and will not snag up in your beard. The virtually static free comb insures that you do not have a frizzy beard when finished. At five inches long, it has a very ergonomic feel for comfortable and quick grooming. This comb can be brittle, especially the fine teeth, so be careful not to drop it. The Rocky Mountain Dual is made from 100% finished sandalwood. 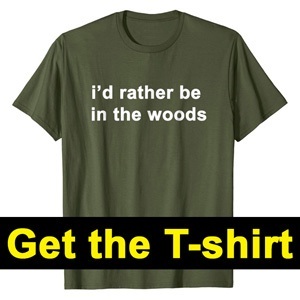 You will also enjoy the smoked wooden smell. The design of this comb allows it to go smoothly through any beard type without snagging. 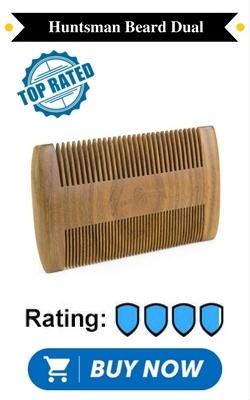 This is a great comb to use for unruly beards. Both sides of this comb feature fine tooth designs. It comes in excellent packaging that can continue to serve as a case. 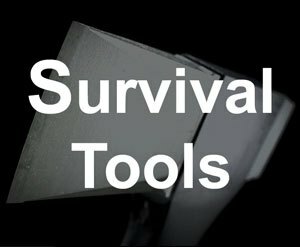 Overall, the comb is very compact and can be easily carried around in your pocket. The Striking Viking features dual teeth, both coarse and fine, that make it compatible with a wide range of beards. The finished wood is anti-static to help beard hairs lay down evenly on the skin. 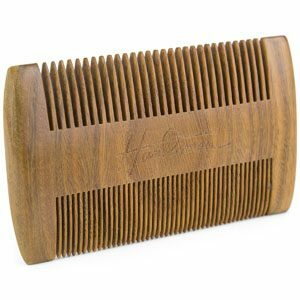 This comb is also fantastic to use with beard oils as it moves oil throughout the hair down to the roots. It is easy to use. The thick side handles and spine give you a sturdy comb that will work through any tangles. This comb also comes with a premium synthetic leather case that protects the comb and serves as a convenient travel case. 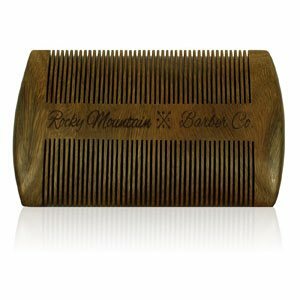 Rocky Mountain also offers a classic comb design with only one set of standard and evenly spaced teeth. It is a comb that works exceptionally well for beards, but also does well with head hair and mustaches. 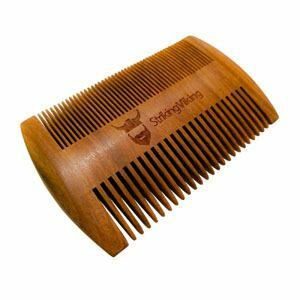 This comb has a solid feel with thick, quality sandalwood. The comb is a great choice that feels great on the skin and will not cause irritation. ﻿It ﻿works for any beard type and is 5.5 inches in length. You can cover a lot of beard in a short amount of time. It is also great for distributing oils and waxes evenly. 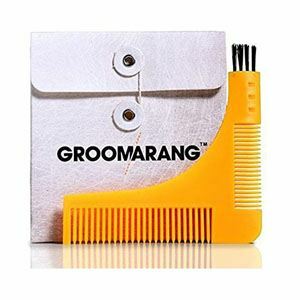 The Groomarang is an interesting option that is quite different from the other combs we have covered so far. This product is more than a simple comb, though it does function as one. The styling tool is made from plastic. It is great if you want to get a really neat and trim beard line. You might have some issues with static build up on the comb portion, but overall it is a quality product. In this care kit by Repsol you get a comb, boar bristle brush, and a cotton drawstring sack that makes traveling easier. For those looking to get into a more robust beard grooming lifestyle, this is a great option with the quality products included. The comb is a classic design made with thick, polished wood that is incredibly easy to handle. This comb features thick, but finely spaced teeth that are smooth and will work through unruly beards with little resistance. 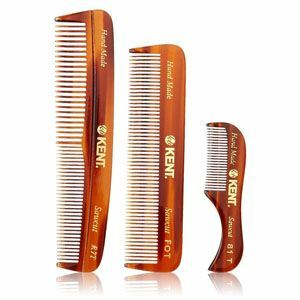 This comb set by Kent uses the same material and finish as our previously reviewed Kent option. 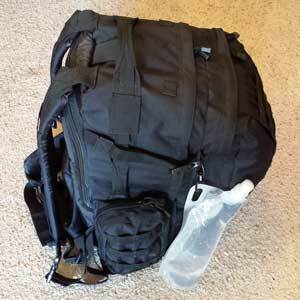 Included in this kit are three different sizes. The compact 81T model reviewed earlier is great to carry around and works well on thick mustaches. The other two are the FOT and R7T models. The FOT is a classic comb design that uses a single row of finely spaced teeth. The bigger R7T model is great for larger, thicker beards and features a single row of teeth. Half of the combs length features fine teeth while the other half is coarse. All of these combs are sturdy and have rounded tooth tips that will not damage your hair. Though they are plastic, you will not have a problem with them causing a lot of static in your beard. 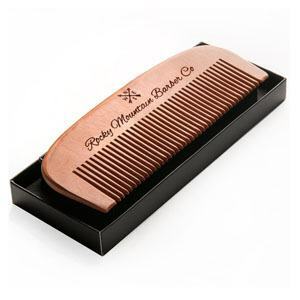 While the two larger comb models are great for your beard, they can also be used for head hair as well. 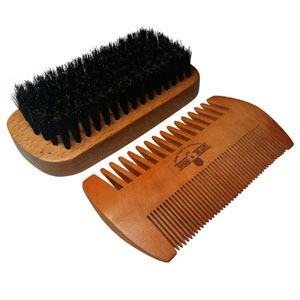 The Grow A Beard Kit comes with a quality oval handled beard brush as well as a dual action tooth comb. 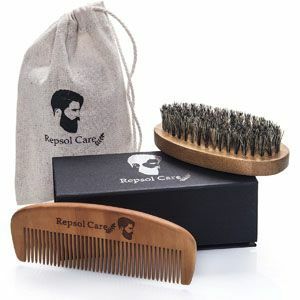 The kit also comes with a drawstring pouch that holds both the brush and comb as well as other beard grooming tools or products you might own. The comb is made from bamboo and has an extra smooth finish that eliminates any potential static build up. You will also like the dual teeth design that lets you work out tough tangles as well as distribute oils and balms efficiently. Beard combs allow you to quickly get your beard under control as well as get rid of tangles to prepare for styling and the addition of balms and oils. Some combs are even great at working in these products. The trick is getting the right wood beard comb. Investing in a great comb allows you to groom and maintain your beard much more efficiently. We have listed ten products that we know once used on your beard you will never go back to using any other typical comb.